It's 9:30pm and the sun has set. I'm walking behind an apartment building my area, almost creeping like a thief in the night. My face is lit by the soft glow of my smartphone, which I'm holding in front of my myself like a beacon. I swipe upward on my smartphone screen. Success! I've done what I came here to do and proceed to sprint out of the shadows. Hopefully I don't run into someone. To anyone else, it looks like I'm taking illicit pictures in the dark of night. I'm actually playing Pokemon Go. This is the Pokemon Company's first foray into the mobile market, via an augmented reality game developed by Niantic. 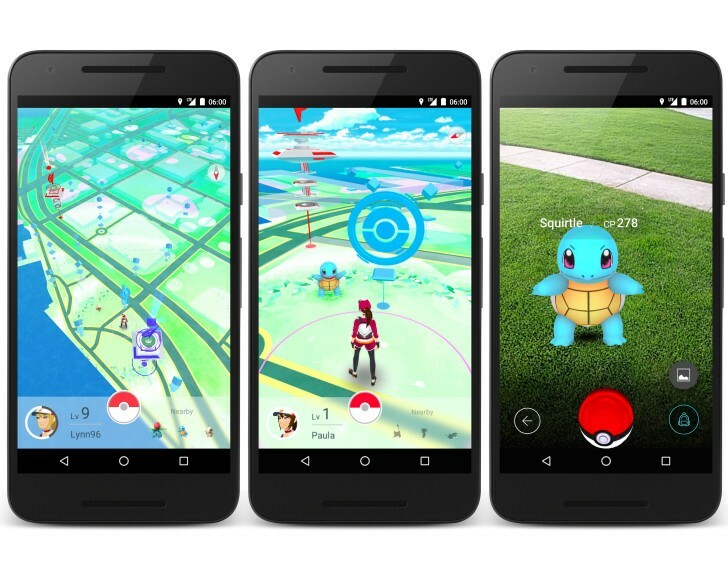 The idea is that you walk the streets of a city or town, searching for Pokemon, Pokemon Gyms, and other PokeSpots. It's a good concept at heart, getting people out of their houses and wandering the cities they live in. Gyms, Spots, and rare Pokemon can be found at different landmarks, so people are encouraged to look around places they live, but have never really explored. Some Pokemon are found in specific areas, like bodies of water, while others are found at night. 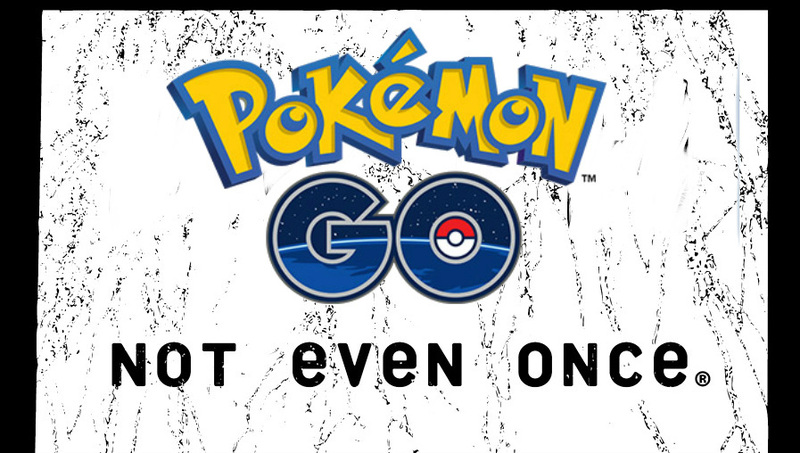 You'll also find new Pokemon in other cities, so you're encouraged to travel. Getting people to exercise is always a good thing, right? Pokemon Go makes people do weird things. I walk or run on a regular basis, so I decided to talk Pokemon Go on a walk in my neighborhood. Over the course of my 2 mile walk, I caught a Charmander, an Eevee, 2 Zubat, 2 Rattat, and a Pidgey. I got halfway to level 4 before the servers went down. I have no clue if the game kept my progress. One Zubat was in the middle of a parking lot, right next to someone's car. Once again, I slide up like a ninja and get my swipe on, hoping the car's owner doesn't come out of the nearby grocery store anytime soon. There was a Rattat inside the local 24-hour convenience store. Pokemon Go encourages you to explore and populates your local area with random Pokemon, but also has set regions for Gyms and PokeSpots. The closest Gym to me is actually a church; I don't want to think of the philosophical implications of that. One PokeSpot near me is at a tattoo parlor, while another is in a Dunkin Donuts. There's another Gym and two PokeSpots that are close to me, but I can't reach them because they're inside a military base and I lack the proper ID. This is where Pokemon Go gets tricky. Just because you can see a Pokemon in a spot, doesn't mean you have access to that spot. If the Pokemon or spot is inside a building that you don't have access to, like a place of business, government building, or someone else's home, it's not easy to do your thing. This leads to people slowly creeping up on or wandering around places, trying to get in range to capture a Pokemon. There's also the situations where transit is involved - on a crowded city street, bus, train, or even your car - and an immediate stop to catch a Pokemon might be a bad idea. 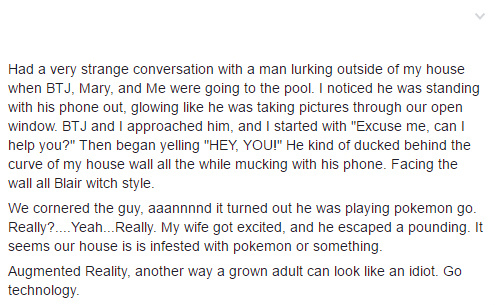 Even if you have access to an area with Pokemon, other people may be present. People who aren't playing Pokemon Go and who may think you're taking pictures of them, their stuff, or their place of work. You're not, but having to explain what you are doing is pretty odd. Once again: Pokemon Go makes people do weird things. Even without that, Pokemon Go isn't all sunshine and rainbows right now. The app wants to be the only thing you're doing on your phone. I had to turn off Twilight, my app for altering my phone's blue light, because Pokemon Go doesn't like overlays. I use Spotify/Pocket Casts during my walks and runs, both of which fight with Pokemon Go over who gets to control the phone audio. Half of the time I switched apps and went back to Pokemon Go, it had to restart. If you're just using Pokemon Go, the app drains battery like no one's business. The limited character creator needs a few extra shades of dark skin. And this is before I even get to the server situation, which is poor at best. So it's interesting and I find that people are really getting a kick out of heading out into the world and finding Pokemon. People just need to play it safe and use some common sense. If there's a Snorlax in your neighbor's back yard, maybe it's better for you to let it go rather than trying to creep over. You don't need to pull a U-turn on a main street because you get a ping for a Geodude. Have fun, but don't get yourself hurt or arrested and don't put others into an awkward situation if you can help it. That said, once the server is up again, I think I'll see if that Eevee is still out in that one parking lot. Tagged with Android Devices,	AR,	Articles,	iPads,	iPhones,	Niantic,	Pokemon,	The Pokemon Company.